On the surface, the capital infusion and executive leadership continuity of this deal makes a lot of sense for Sprint and its shareholders, but much less so for SoftBank and its shareholders. So what's going on beneath the surface that would make this deal make more sense? What does SoftBank foresee that others do not, or what strategic benefit does Softbank bring to the table that others do not, that could transform this pedestrian financial engineering play into the game-changing strategic play to which SoftBank's entrepreneurial founder clearly aspires? If we assume that this deal is about more than finance and ego, there must be something else that makes it all add up. I don't profess to know what it actually is, but in trying to scenario-out what that "something more" could be, my most plausible theory is that SoftBank, in buying ownership control of Sprint and its Board of Directors, is now a stalking horse speculator for some other future opportunity they foresee, or is acting as a friendly seat-warmer for someone bigger in the queue. More specifically, SoftBank's multi-billionaire founder, Massyoshi Son, may see potential hidden strategic value in what Sprint has that others apparently do not: e.g. An established wireless business platform, upon which another strategic player could build and integrate. If we think outside the box of the current market thinking and valuation, and analyze the many curious circumstances and coincidences here, many point to the potential eventual involvement of a game-changing silent partner: Google. Why would a SoftBank-Google partnership make sense? Why would Google have a strategic interest in Sprint-Clearwire? Why would Google want to be a silent partner at this time? First, why would a Softbank-Google partnership make sense? Few are aware of the Softbank-Google relationship. In July 2010, SoftBank's Yahoo Japan subsidiary outsourced Yahoo Japan's dominant #1 search and advertising monetization platform to the #2 competitor in Japan, Google, which gave Google a 90% search advertising monopoly in Japan. Amazingly, SoftBank was able to persuade Japanese antitrust authorities to sign off on the de facto monopolization deal. That same month in 2010, SoftBank strategically co-invested in Zynga with Google corporate, not Google Ventures. And in 2011, SoftBank was an early Japanese big corporate adopter of Google Apps for its 26,000 employees, and also launched an Android-powered "Yahoo-phone" in Japan. Importantly, Softbank and Google's founders both started in then software/Internet business and then evolved and converged their tech-rooted businesses into communications. And more importantly, both share an entrepreneurial-founders' kinship for thinking big, looking ahead, taking big risks, and leveraging big technological disruption against incumbents to grow. Interestingly, in 2008 Google was an early $150m investor in Clearwire with Sprint, Intel, and cable companies. More interestingly, Google's original investment, knowledge and investment relationships could be what enabled SoftBank to confidently buy Sprint without having to explicitly control or buy out Clearwire at a big premium in the transaction, because SoftBank could be confident that Google and its allies could cheaply nudge SoftBank-Sprint's Clearwire ownership over the 50% control threshold. In addition, reportedly "Softbank, which has been eying the U.S. market since the summer, is said to be focused on acquiring only Sprint," per the FT, and no other domestic or foreign suitor for Sprint has yet emerged. These circumstances suggest a singular and special Sprint-specific play not a generalized or obvious U.S. wireless play. Second, why would Google have any interest in Sprint-Clearwire? Besides having an long-held ownership stake in Clearwire, with which Sprint partners, of all the cities in the U.S, and of all of the 1,100 cities that applied to be the first site of Google's 1 Gigabyte pilot Fiber deployment, Google chose Kansas City, home to Sprint's headquarters and one of Sprint's Global IP Backbone Nodes. Coincidence or strategic? It is noteworthy that after initially announcing Google Fiber as a proof-of-concept, one-city experiment, Google is teasing that it now may deploy to more cities. 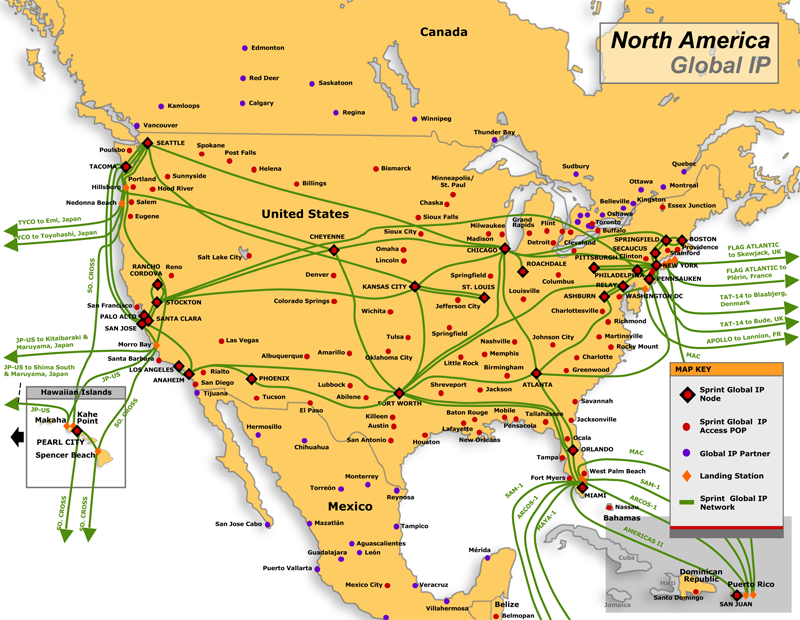 Google knows Sprint is one of the three original companies which managed the first Internet Network Access points in 1994, and that Sprint is still a global Tier 1 Internet backbone provider. Google Fiber is currently building out an ultra high speed 1 Gigabit broadband access network in Kansas City, and has 500 million Android devices activated globally, so the scale and economics of Google's world leading traffic may be nudging Google to have a stronger strategic relationship with a Tier 1 backbone provider like Sprint, in order to better connect additional Google Fiber cities and the next 500m Android phones Google expects to add globally in the next year. Google has sufficient demand for its own Tier 1 Internet backbone. Google generates a world-leading amount of global Internet traffic, generating 89% of landline searches, 97% of wireless searches and broadcasts four billion hours of video monthly viewing over the Internet to over 800 million unique YouTube monthly users. Having a stronger or more integrated relationship with a backbone provider could have substantial cost synergies with Google, especially in optimizing YouTube's caching needs. Google was opportunistic after the 2001 tech bubble burst in exploiting a huge over-surplus of fiber capacity by quietly acquiring a substantial amount of dark fiber around the world. The question here is can the leased dark fiber patchwork network and arrangements that connect its data centers continue to suffice as Google Android continues to a billion users by next year and if Google plans more Google Fiber cities? Remember speed leadership in the Google ecosystem is a central obsession, goal, and core competency of Google. Google has taken singular leadership in making the web faster. It is a leader in making most everything related to the Internet faster, e.g. Trasmission Control Protocol (TCP) faster; Domain name System (DNS) look-up faster by becoming the world's largest DNS provider in three years; and in optimizing system caching, which can enable Internet websites to load twice as fast -- to name just three of Google's big web-speed-enhancing initiatives and integrations. Remember that Google is also laser-focused on taking the core functions that drive its system and reengineering them to run faster and better. Larry Page's "more wood behind fewer arrows" focus is essentially an integration strategy as his Google+ social effort is all about integration. Google's controversial consolidation of sixty privacy policies in March was also all about better integration of Google's hundreds of product and service building blocks. Remember that Google has taken a big activist role in pushing faster broadband that forwards its business model by: leading the charge for net neutrality and for the FCC's National Broadband Plan; by aggressively and successfully bidding up the 700 MHz spectrum auction to trigger FCC open access conditions; and establishing a 1gigabit ultra-fast broadband access network pilot in Kansas City. On top of all that, Google also believes that it can do the core competencies of other industries better than those industries do -- and often does. Google innately thinks very differently and pathologically disruptively. Over a decade ago, Google re-imagined the server as a cheap disposable device where software, not hardware would provide computing reliable performance; hence Google has long built its own servers that power its data centers. It also re-imagined data storage and retrieval to scale in the petabyte range for ultra-large databases with its innovative Big Table design. Recently, it was the first to solve the thorny parallel processing problem of synchronizing all its servers around the world with its efficiency-increasing Spanner innovation that embedded atomic clocks in servers to ensure they are all perfectly synchronized with the same information, thus limiting inefficient or unnecessary re-processing. Its Google+ omni-integration signals Google is expanding and integrating 360 degrees with designs on entering most every part of the broader Internet ecosystem. Android, Google-Motorola, and Google Play are at Apple. Chrome, Google Docs, and Google Apps are at Microsoft. Google+ is at FaceBook. Google Wallet, Checkout, Shopping, and Books are at Amazon and eBay. Google Fiber and Android are at ISPs. Google's YouTube investment in proprietary YouTube content is going at cable, broadcasters, DBS, ISPs, and all proprietary video content producers. Google News is at the media. Google-ITA is at the travel industry. Google Finance is at financial companies. etc. etc. etc. Interestingly we have learned from wireless industry legend John Stanton that Apple's Steve Jobs, wanted "to replace the carriers" and create his own carrier with WiFi spectrum. Key to Apple's strategy was to control as much of the product and service as possible. Sound familiar with Larry Page's integration strategy? (Remember that Apple and Google were most closely-aligned before the launch of the iPhone and before their bad falling out over Google allegedly stealing Apple's intellectual property with Android.) Another interesting link here is that John Stanton was part of the Google investment in Clearwire in 2008 via Trilogy Partners. Google does not need to acquire a company to reap most of its integration benefits. Google Chairman Eric Schmidt uses the term: "merge without merging." The web allows you to do that, where you can get the web systems of both organizations fairly well-integrated, and you don't have to do it on an exclusive basis." The open question is how they will do it in wireless. From a regulatory perspective we know Google has pushed for free unlicensed spectrum to undermine the auctioned spectrum model. Google is pushing the Administration via the PCAST report to clear no more spectrum for auction, but to have government "share" spectrum with the private sector in an unlicensed manner (this cleverly would enable Government to continue to control 85% of the nation's spectrum and bypassing Congress, effectively impose net neutrality obligations on this shared unlicensed spectrum.) Limiting auction of more spectrum conveniently would also make Sprint-Clearwire's 2.5 GHz spectrum much more valuable, because it is a unique 150 MHZ spectrum asset for use in the likely denser-cell architecture of the future. Technologically, if Google wants to improve and optimize the key part of the ecosystem that it does not own and control now -- i.e. broadband access and transmission (wire line and wireless) that limits how Google can optimize and speed up its ecosystem relative to everyone else's -- Google is logically thinking strategically how it could do that long term. One pretty-well supported theory is that aligning with Sprint via a trusted partner SoftBank could allow Google many upsides while avoiding many of the downsides I will discuss later. Third, why would Google want to be a "silent" partner at this time? First Google is exceptionally secretive about its business and shrewd in holding its cards close to its vest. Google loves to partner, and to work through others, to achieve its strategic goals behind the scenes. Look to the Open Internet Coalition, the Open Handset Alliance, and the Internet Association for just three examples. Google's opposition to the EU's privacy laws, regulations, and investigations. Simply, why would Google want to kick known hornet nests that could complicate government approvals of the SoftBank-Sprint transaction and its future plans, if it could avoid it? On the surface, the public investment rationale and story justifying SoftBank's purchase of Sprint appears weak and strongly suggests that there are things that are hidden beneath the surface that are really driving this transaction. I repeat, I don't know if "something else" is actually going on like a Google silent partnership with Softbank in the Sprint transaction, but as an analyst focused on discerning the future and seeing the world whole, there is a whole lot of circumstantial and other relevant evidence that indicates there is much more strategically to this transaction than SoftBank has shared to date, and that there is a very plausible theory that Google has much broader designs on the wireless and backbone market in general, and SoftBank-Sprint-Clearwire in specific. Simply, if Google seeks to become more fully-vertically-integrated, or omni-integrated as only Google can, SoftBank-Sprint is a potentially valuable strategic asset for Google, in the vein that Google-Motorola enables Google to engage in more efficient/effective software-hardware integration. If Google were to "merge without merging" or to acquire SoftBank-Sprint in the future, Google then could be the only global player to integrate Internet, software, hardware, communications and content. If that is Google's omni-integration ambition, SoftBank-Sprint would be a logical strategic building block for that long-term vision. Google thinks ahead and sees the world whole better than most any player in the market from my experience after studying them in great detail for several years. Everyone would be well-advised to dig deeper on this transaction, because there is very likely much more than meets the eye.